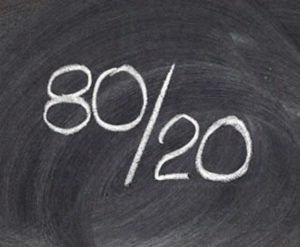 The Pareto Principle, named after an Italian economist-sociologist, Alfredo Pareto, states that the significant items in a given group normally constitute a relatively small portion of the total items in the group. 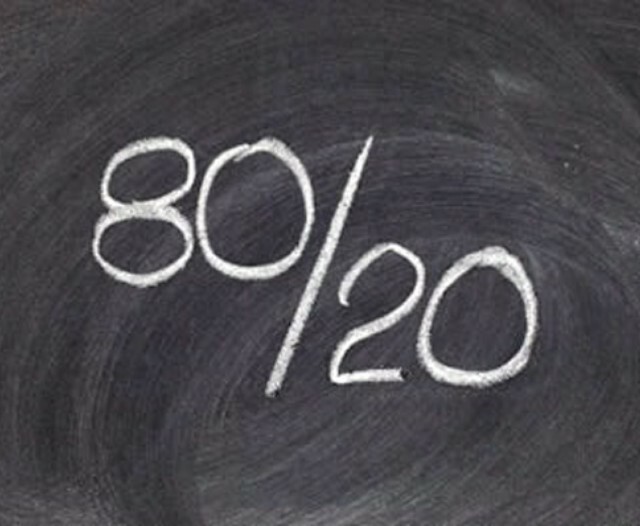 The ratio that holds true in most cases is 80:20. For example, 20 percent of the promotion techniques you use achieve 80 percent of the results, 20 percent of the items in inventory account for 80 percent of the total inventory cost, and so on. Knowing these ratios does nothing to increase business. But taking action will. See where this principle applies in your business and then see what you can do to take advantage of these facts. If you are in a retail business or managing a pharmacy or whatever, here are a few examples. If 80 percent of the traffic takes place during 20 percent of the day, identify this time period and declare it sales time. Have additional staff during this time if necessary. Make sure everyone devotes as much time as possible to customer service and selling. Tell your staff not to work on administrative tasks or take coffee breaks during that time period. They can do the maintenance and administration tasks during off-peak times. If 80 percent of the sales seem to be generated by 20 percent of the staff, train all employees on the basics of up selling and customer service as well as product knowledge. And make sure those staff members who interact well with customers are not hidden away in the back room. Recognize their performance. Provide additional training. A 10% increase in their performance will make a greater impact on the bottom line than a 10% increase in the performance of your least productive employees. If about 80 percent of the shoplifting occurs in 20 percent of the available hours, security should be concentrated during these peak hours. And you should be well staffed. There is a correlation between shoplifting and customer service so interaction with customers should be greatest during this time period as well. If 80 percent of the sales come from 20 percent of the store’s traffic, figure out how to get even more sales out of those existing customers. According to some marketing experts it costs five to ten times as much to find a new customer as it does to retain an existing one. And since regular customers buy more, make more referrals and are less price-sensitive, it would pay to get to know your customers. It would also be wise to see how you can get more traffic into the store and keep them there longer, since sales varies with the length of time spent in the store. You could also attempt to convert some of those 80 percent browsers into customers. If 80 percent of your sales take place during 20 percent of the year, you must maximize the use of this prime selling time to generate as many sales as possible. But you should also try to convert lower sales months to higher sales periods. The Pareto Principle could apply to the names on your promotion list, the source of shrinkage, customer complaints, returns, and staff lateness as well as other areas. When you spot a Pareto Principle ratio, take action. The greatest time management strategy is to live longer. I suppose whenever I pass another birthday (83 this month), my thoughts return to thoughts of loving life. The good news, according to statistics, is that we’re living longer. The bad news is that our bodies frequently outlast our minds. Dementia is on the increase. To gain time by living longer and healthier, we must look after our brain as well as our body. Physical exercise keeps the blood circulating throughout the brain where we need it most. It also helps to build new brain cells and improves learning and memory. So keep up a physically active lifestyle. Lifelong learning, and the constant mental stimulation that it provides, will offset some of the cognitive decline we experience with aging. Avoiding stress where possible, and being able to cope effectively with it when it does occur, will prevent brain cells from being killed. Minimize the hassles in your life. Social activities of any kind, where you are interacting with others, force you to practice cognitive activities as you carry on conversations. Diet can also help. For example, older people, who get omega-3 fatty acids by eating fish such as salmon and sardines, or take DHA and EPA supplements, are believed to be able to slow cognitive decline as well. An active lifestyle, both physically and mentally, is good for your overall health, including the health of your brain. 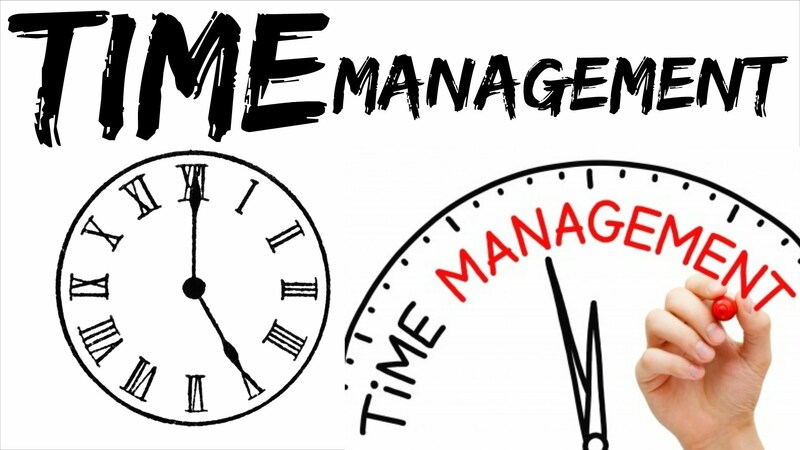 And the most effective time management strategy I know is to live longer and healthier. 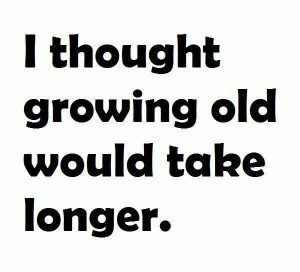 Age has its benefits besides senior discounts. Research doesn’t back up these opinions. In fact, older adults are actually happier than younger people, at least in the research reported to date. And population-based surveys reveal that rates of depression are highest in those between 25 and 45. The happiest group overall is men aged 65 and older. In one study of 28,000 Americans, a third of the 88-year-olds reported being “very happy” and the happiest individuals surveyed were the oldest. Older people are more likely to recall positive than negative information, so that should also help. 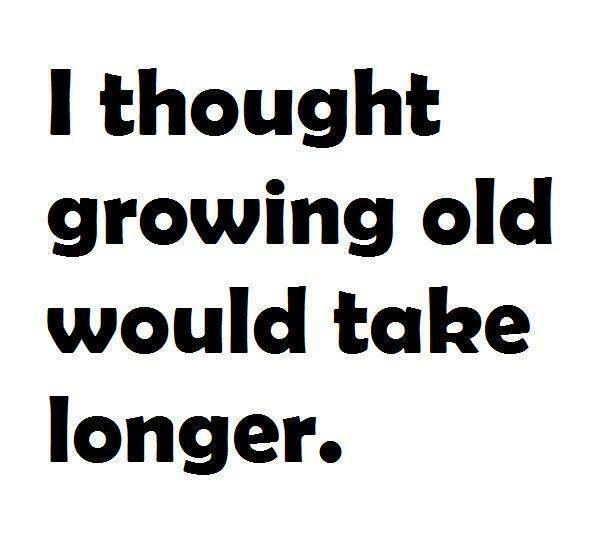 And cognitive abilities do not fade dramatically with age. We do experience some memory loss and forgetfulness; but serious illness of the brain aside, intelligence and verbal abilities are not much different than they were decades earlier. So being over the hill, doesn’t mean you’re not able to climb more hills. Purpose beats profit hands down. He refers to a study of University of Rochester grads who were asked about their life goals, and then were followed up early in their careers. Some had “profit” goals such as to become wealthy or famous, and others had “purpose” goals, such as to help others improve their lives or to learn and grow. Those with purpose goals, who felt they were being attained, reported higher levels of satisfaction and well-being than when in college, and lower levels of anxiety and depression. However those with profit goals reported levels of satisfaction and self-esteem that were no higher than when in college. They had reached their goals; but it didn’t make them any happier. So attainment of profit or materialistic goals could have little if any impact on well-being. But it does impact the pocket book. Of course I see nothing wrong with having both profit goals and purpose goals at any age. But being is more important than having, and purpose is more important than profit. There’s a book called Your Money or Your Life by Joe Dominguez and Vicki Robin that describes a Fulfillment Curve. This curve plots money or possessions or “stuff” along the x-axis, or horizontal axis, and fulfillment or happiness along the y-axis, the vertical axis. The more money you have to spend, the greater the degree of fulfillment and happiness – up to a point. After fulfillment goes through the survival stage, comforts stage and luxuries stage, it levels off. Then it starts to decrease. Once you have achieved what the authors refer to as enough, acquiring more simply makes you unhappier. It’s interesting to note that Daniel Pink also mentions in his book, A Whole New Mind, that while living standards have risen steadily decade after decade, personal, family and life satisfaction haven’t budged. Material things consume a lot of our time. People spend their precious non-renewable resource, time, in order to acquire more money and possessions, only to discover that the possessions do little to further their enjoyment of life. In fact, possessions consume even more of this non-renewable resource. Not only does it take time to earn enough money to buy this stuff, it takes time to shop for it, learn how to operate it, maintain it in good working condition, repair it, upgrade it, insure it and use it. If we have to rent public storage, we have to sign a contract, pay rent, buy a lock, take trips back and forth to check on it or add to it, and so on. We are afraid of losing it, breaking it or having it stolen. We frequently have to make payments on it, acquire more space to accommodate it, and worry about keeping the neighborhood kids or the family dog away from it. There also comes a time when we have to figure out how to get rid of it. From the viewpoint of cost, stress and time management, you should simplify your life as much as possible. Simplifying your personal life involves freeing up more time and energy to pursue your personal goals and working on activities that you really enjoy. Getting rid of the possessions that threaten to possess you is a good place to start. 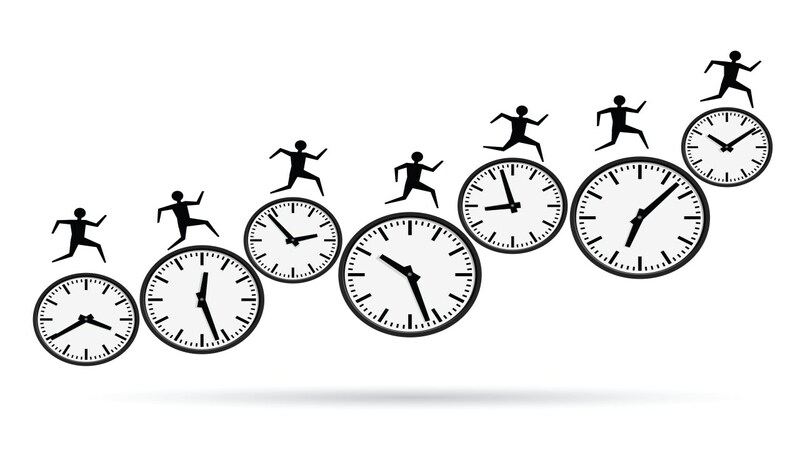 Ten time management myths: Part 2. Myth #6. The biggest time wasters are interruptions, which include email, meetings and rush jobs. I call that a myth because none of those are really time wasters – not if you follow my definition of a time waster, which is an activity, within our control, that does not contribute to either our personal or organizational goals. Rarely can we control an interruption, and if we can, it no longer becomes an interruption. The same thing with meetings and rush jobs. And yet all of these things could contribute to our goals – especially if one of those telephone interruptions were a customer wanting to buy our product, and our goal was to sell a certain volume of products. I look upon these as “time obligations”, meaning we are obliged to put up with them as a part of our job. But the real time wasters are such things as procrastination, perfectionism, poor listening habits, inability to say no, anger, forgetting things due to a failure to write them down and so on. These are all controllable if we manage ourselves effectively with respect to time. Where people should concentrate when attempting to manage their time, is not on the obligations – at least not initially. They should concentrate on eliminating the time wasters – the things that they can control. Myth # 7. It’s more efficient to stick to one task until it’s completed. Normally people have a dozen or more projects on the go at any one time – each with its own deadline. Other people may need to know when they are going to be completed; but they also need to know how they are progressing. They want status reports. But even if you only had one large task – say to write a book on your area of expertise, it would still be more effective to work at it in chunks of two hours or less then to work at it steadily from 9 am to 5 pm every day. For one thing, you are justified in engaging your voice mail and ignoring your email for two-hour stretches, but not 8-hour stretches. People will wait two hours for you to return their calls, but rarely eight hours. In the same way, you can close your door for two hours, ignore your email for two hours, and even go without a coffee for two hours. .In other words, you would have fewer interruptions from others if you worked at your task a few hours at a time – and you would have fewer self-interruptions as well. Myth # 8. We should have one planner for the office and a separate planner for the home. The key word here is, should, because I know times are changing and many companies insist on online planners in the office. This allows for instant communication when setting up meetings etc. Even so, I feel everyone should have a portable, hard copy or electronic planner that goes where they go, whether at the office, home or on the road, that records all their activities, personal, family and otherwise. That’s why our planner (The Taylor Planner) allows scheduling from 7 am to 10 pm, 7 days per week. I only have one life so I feel I should only have one planner. Many people have two or more planners – one on their desk, another in their pocket or purse, another on the fridge at home – all for convenience. But it’s not convenient if they mark something in one calendar and forget to record it in another one. When we are at home, we should know what our business commitments are, so we don’t promise things we can’t deliver – and when we’re at the office, we should know our family commitments so we don’t promise time that has already been allocated to our family. Myth # 9. Technology has increased productivity. In my opinion, personal productivity has changed very little in the past 30 years in spite of technology. The net result of technology has been to speed up the pace of life. We are working faster, driving faster, communicating faster, eating faster – in short, living faster. The time savings gained by technology have been offset by increases in complexity, choices, interruptions, expectations, stress, delays and errors. Our bodies are not designed to operate at warp speed and we are faced with a variety of ailments to the point that “getting well” has become another time consumer. We have automatic washers and dryers; but we have more clothes to wash and we wash them more often. Cars go faster; but we have more distances to travel and we have to contend with more traffic, construction, and gridlock. We complete specific tasks quicker; but experience more interruptions and timewasters. And so on. The good news is that we do have a choice. We can decide what technology we will use, when we will use it and how we will use it. And we can decide what we will do and how fast and for how long we will do it. And one of the biggest challenges is to convince ourselves that multitasking is neither productive nor healthy. Well, certainly time allows you to earn money. In fact, it is the one resource that allows everything else in life to happen. But to say that time is money is too narrow a view. It seems to suggest that the main purpose of time is to allow you to earn money. In business it is easy to accept the metaphor. Consultants, attorneys, CA’s, CPA’s actually charge clients based on the hours expended on their accounts. In fact all of us, either directly or indirectly are selling our time. And since time is life, we are trading pieces of our lives for money or other “things”. And the “other things” are sometimes more important than the money. I prefer the definition “Time is life” for this reason. It places a more realistic value on time. You can always earn more money, but you can never obtain more life. You can only use what has been allocated to you. There just “ain’t” no more! So if time is life and we love life, we certainly should love time. In which case we won’t treat it so shoddily as to waste it or kill it. But it is important to manage ourselves in such a way as to show respect for that awesome creation called life. Let’s not trade our very lives for unprofitable, unpleasant or irrelevant activities. Trade it for those things that are important, meaningful and enjoyable to you, and to those close to you. 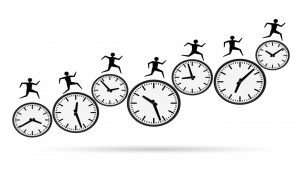 Ten time management myths: Part 1. Myth # 1. We can manage time. The biggest myth is that we can manage time. We cannot influence time one iota. Time is managed perfectly by itself. We can only manage ourselves in the time we have available. We are given 1440 minutes each day to use as we please. We can’t change that amount. We cannot save any of it or even spend less of it. If we sit idle, doing nothing, time doesn’t stop with us – it ticks on relentlessly. At the end of the day those 1440 minutes are gone, regardless of what we did during the interim. It’s what we do while time is passing that’s important. No one can manage time; but it is within our power to manage ourselves. Time is an ally not an enemy. It provides the medium in which you can excel in your job, and in other areas of your life. Myth # 2. Time management is getting more done in less time. This may be one of the results of time management, but it is certainly not the essence of time management. The problem with associating time management with the volume of work is that it forces us to focus on the number of things accomplished instead of the types of things accomplished. You may recall the difference between efficiency and effectiveness. Efficiency is getting things done in the best possible way; whereas effectiveness is doing the best possible things. There’s a difference. You may streamline the production of a report so it’s accomplished swiftly, efficiently and on time. But if that report does nothing to further the goals of the organization, the production of it is a waste of time. It’s efficient but not effective. Similarly, effective time management is not getting more done in less time; it’s getting fewer things done, but of greater importance, in the time that is available. Myth # 3. “To do” lists help get things done. Perhaps I’m pushing it a little to call this one a myth. After all, they do help indirectly by preventing us from forgetting all the things we have to do. But they do absolutely nothing to actually get the jobs done. And the problem with touting the necessity of keeping “To do” lists is that people tend to concentrate too much on making lists and not enough time completing the items on the lists. There are people who keep pages and pages of things to do and seem to have no time to do them. Because the list gets longer and longer, and they don’t want to have to recopy too many items, they are tempted to see how many things they can cross off before the end of the day. So the objective becomes crossing off items rather than getting priority jobs done. There are actually people who do things that are not on their lists and they quickly write them on so they can cross them off. How’s that for productivity? Another problem with “to do” lists is there is no built-in commitment. You can prioritize them by labeling them A, B, C and so on, or by color-coding them, or by re-copying them in order of priority; but after all this, they are still simply lists of things you intend to do. Meanwhile, what actually gets done are those things you schedule into your planner. These are usually other people’s priorities – those meetings, appointments, and conference calls – everything involving other people. These are commitments because you have actually reserved the time for them, and you will say “no” to other people in order to protect them. What I am advocating, of course, is that the next time you identify a priority task that must be done, instead of adding it to a “to do” list, schedule time in your planner to do it. Make an appointment with yourself to work on it – just as you would make an appointment with a client, customer, associate or friend. Myth # 4. People need a “personal organizer” or other time management tool or App in order to get organized. Unfortunately many people feel if they buy into a system, it’ll make life easy for them. There’s nothing further from the truth. Some of the organizers, forms or Apps are so complicated to use, that if you’re organized enough to use them, you don’t need them. If you’re not organized and not self-disciplined, an organizer will only consume more time. That’s not to say organizers or any of the various Apps are not good. But people try to put the cart before the horse. You don’t get organized by using an organizer; you use an organizer to streamline your time management skills once you are organized. Myth # 5. A “quiet hour” is an effective time management tool. Well of course it would be, if there were such a thing. But no one is immune to interruptions by other people. Close the door and they’ll come in through the windows! There are email, voice mail, text messages, telephone calls, mail delivery, couriers and half the organization wanting to infringe on our privacy, and in many cases they are successful. If we tried half the things that books and articles suggest we do to keep from being interrupted we’d be spending more time fending off others than working. We should accept the fact that there will be interruptions and allow for that in our scheduling. If you feel something will take an hour, schedule an hour and a half. And don’t schedule too tightly. Leave plenty of spaces in your planner in the event that some of your priorities do have to be rescheduled. This is not to say that we should not try to make those meetings with ourselves as interruption-free as possible. If you have a door, close it. If you have voice mail, engage it. If you have assistants who can intercept intruders and handle some of the urgent items, use them. But recognize that even if you eliminated all the external interruptions you’d still have to deal with the enemy within – that is, yourself. 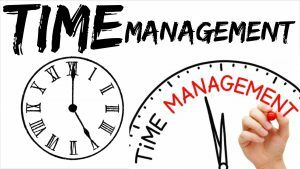 Note: Next week’s blog article will conclude the ten time management myths.